Looking for the best Brisbane Window Cleaning Company? Dirt, dust, grit and grime build up quicker than most people think on exterior and interior windows. Whether it’s for a shop-front, office or living room, keep windows looking sparkling clean by hiring a reliable window cleaning service.. 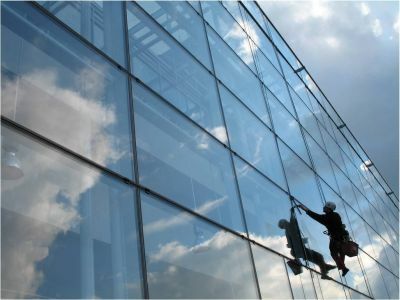 Recommended Brisbane window cleaning companies undergo an intensive examination to ensure they deliver dependable, quality service to their clients, with the very best earning the “Fully Verified” distinction. Sorry to disappoint! TrustedCleaner is in the process of verifying window cleaners in Brisbane. In the meantime, please consider some of the short-listed companies below. If you feel a local window cleaner deserves our consideration, please don’t hesitate to contact us. Servicing the whole greater-Brisbane area, Spotless will take on a projects whether it’s commercial or residential. Specializing in commercial and high-rise properties, O’Brien’s is the one to call when Brisbane’s highest windows desperately need a squeegee. Using environmentally friendly cleaning techniques and offering a 100% client-satisfaction guarantee, O’Brien’s won’t waste water or time when taking on a job. Small-scale and family owned, Phil’s Cleaning adds a tangible touch of personal care to every job. Squeegee clean and dry with soft, touch-up towels. For just over five years, City Wide Window Cleaning Brisbane has been cleaning the windows of Brisbane’s homes, hospitals, schools and businesses with quality-focused, timely service. Though they do recommend considering a regular cleaning schedule, City Wide will readily accommodate those home or business owners just looking for a one-off, clean and polish. Reflections Services has been helping to keep the windows of Southeast Queensland clean since 2003, and is know as a reliable Brisbane window cleaning company. Locally owned and operated, they have managed to blossom from small beginnings to become one of the largest window cleaning companies in the region in just over a decade. Commercial, residential and rope-access-only jobs are all readily quoted. “No mess, no fuss… just good old fashioned service you can trust,” that’s the motto of Big Red Window Cleaning. Taking advantage of Water-Fed-Pole and Pure Water technologies, Big Red will clean windows up to five storeys high. While that’s not the best news for those in high-rise buildings, its great news for those in smaller structures—Big Red won’t have any “larger” projects looming on the horizon to tempt their attention elsewhere. Other Cleaning Options in Brisbane, QLD: Residential and Commercial Carpet Cleaning, Tile and Grout Cleaning and Gutter Cleaning.